Hello followers! Hope everyone is great! 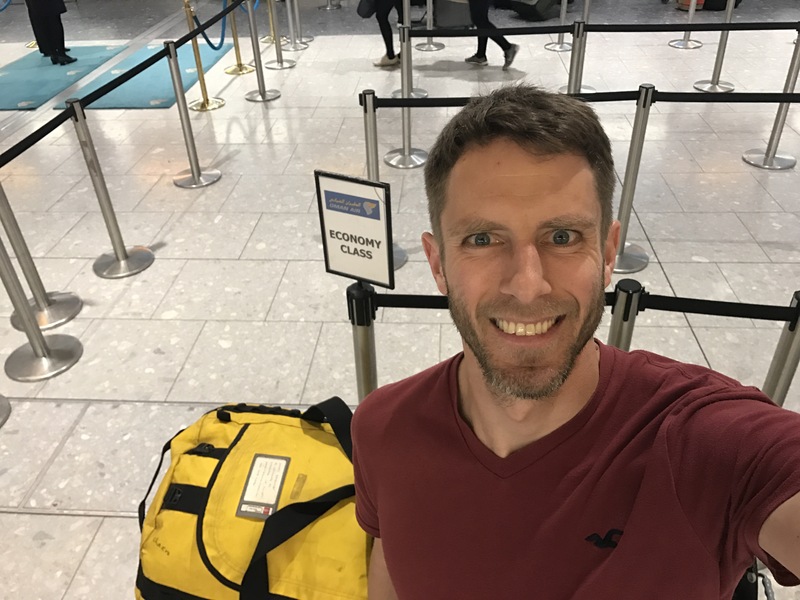 Just a quick note – I’m heading on the next adventure. At the airport on my way to Kathmandu to attempt to climb Mt Everest. And to make it more interesting I’m going to try without using supplemental oxygen. It’s harder and more dangerous – wanted to give you most for your time! Day T+5: Why is doing nothing so tiring? Ah its been a lovely week of relaxation, despite it actually being quite hard to adjust to not running all day. I feel far more tired and lethargic now I’m not doing anything than when I was running for 8 hours a day. I did however take the advice of several people and have tried to continue running. 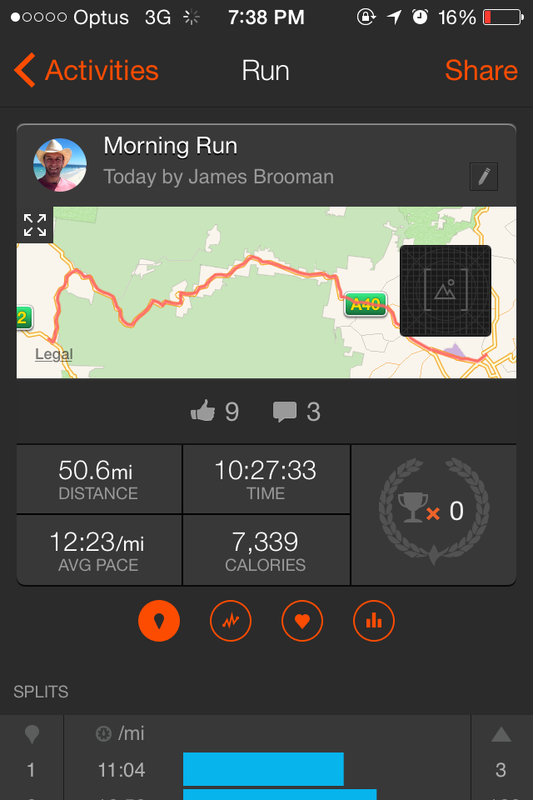 It has helped; as part of the new James 2.0 I am trying to develop the habit of going for a run first thing in the morning, something I used to hate it. 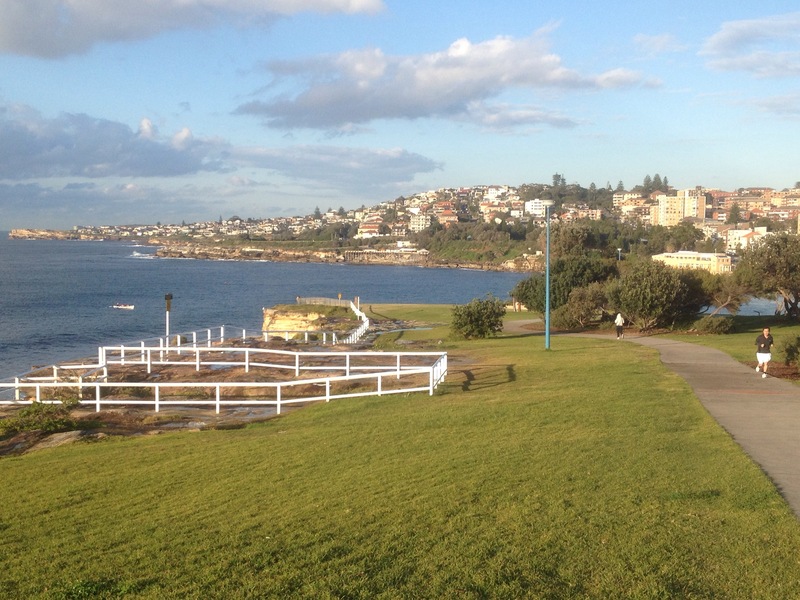 A stunning run along the coastal path between Coogee beach and Bondi beach has certainly helped my retraining. Just a walk in the park – but what a park! Oddly, I am a slower runner than when I left for Australia. I think it must be due to the type of running I’ve done, just slow and steady. Fast running is still just as difficult as it was before which is surprising. I guess it just proves the maxim that you have to train specifically for what you want; slow running won’t make you faster, and fast running won’t help your long runs. At least not much, anyway. Food for thought for all you runners out there. So now I have take an aeroplane (AMAZING CONCEPT) to Cairns in Northern Queensland in search of warmer weather; something I have had some success with. The beach run is now replaced with… another beach run. But this time in a t-shirt! The sunrises are equally fabulous. Finally just a quick thanks to everyone who bought a copy of my book – North to South: A man, a bear and a bicycle – on Amazon, and a special thanks to all those who said they really enjoyed it! I have decided to write another book around this trip, but as the last one took 6 years I would start with the current one if I were you! Stay tuned for a ‘tricks and tips’ post coming soon. 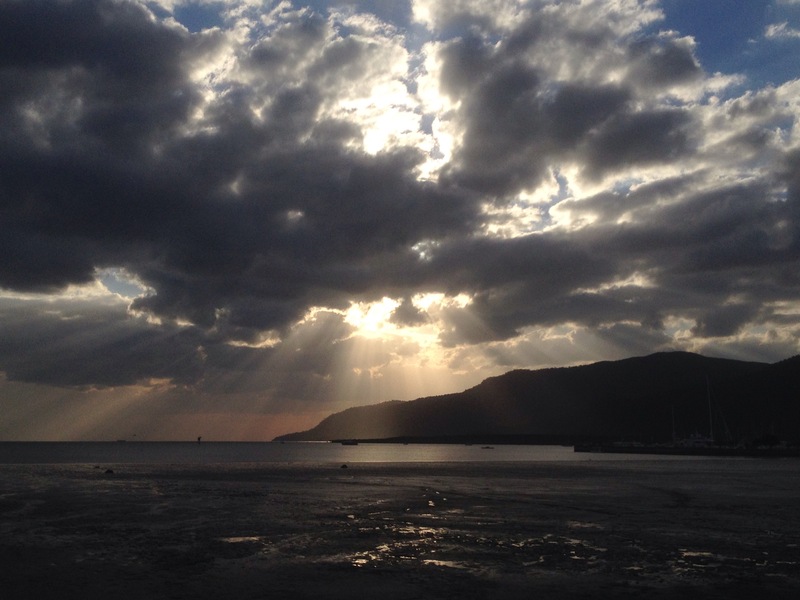 Day 82: The Finishing Line! I was up as early as I could, no mean feat after the previous day’s battering. I slowly sorted myself out and after eventually repacking my stuff I opened the curtain to the bay doors overlooking the river below. Rain and grey overcast skies stared back, a miserable start to the last day. Nothing for it than to get going though. Fortunately it was only really drizzling and I kept focused on the positive, which consisted of the moody and dramatic views plus the fact I had a bicycle lane. After a couple of miles I spied a McDonalds, time to get a coffee and muffin. I have never seen a busier McDonald’s at 7.20am on a Sunday morning. It was rammed; clearly a meeting point for various clubs and groups off to do things. I wrestled in and ordered, and was eventually on my way. In another 15 miles was the next one, a good spot to warm up a bit again before the hard section – the motorway. I saw the ‘no pedestrian’ sign as I pulled onto it, but bicycles were allowed and so I figured I was just a slow bicycle. After 5 miles the highway patrol decided I wasn’t. 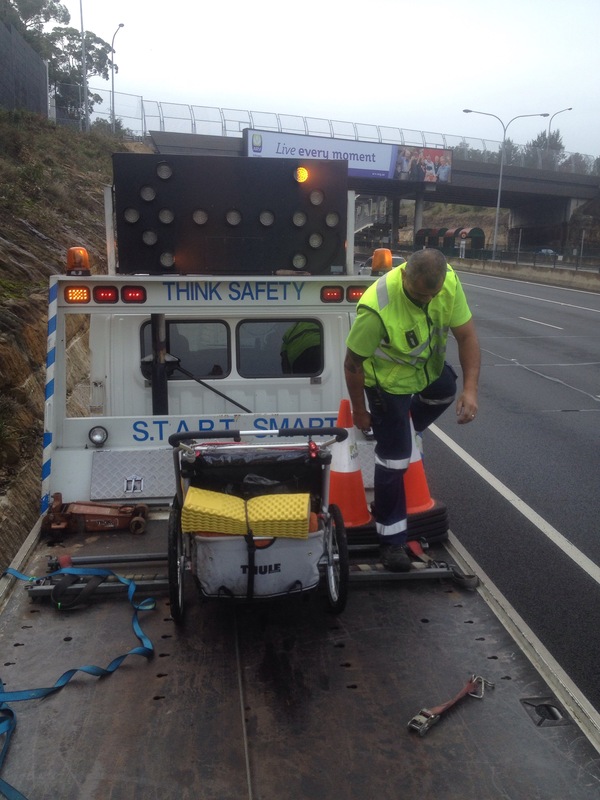 ‘It’s too dangerous’ said the jobsworth who pulled up in his breakdown truck. He phoned his supervisor and they decided that going to the end of the cycle lane in 20 miles was crazy, so I needed to be escorted off the motorway; they wouldn’t even let me run to the next junction. Arguments of logic (100x safer than the mountain road, highly visible, huge lane just for me) and compassion (last day, I’ve already done 4,000km) had no effect, so the guy drove me from a 4 lane motorway with a beautiful 4m wide bike shoulder just for me to a 6 lane ‘A’ road with no shoulder and the same speed limit. Explanations that it was suicidal and irresponsible lunacy to leave me there was met with a blank smile – he was a removal guy and he was paid to remove things, not think, end of story. And so with my ending time target in the balance I went to plan B, a cross town mishmash of side roads and main road with either broken footpaths or no footpaths. Oh, and over some ridiculous hills and bridges to make it unbelievably stressful. Not cool at all! 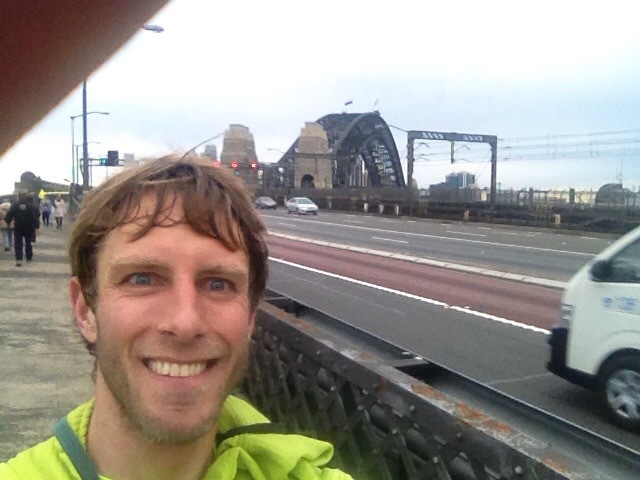 I ran non stop as fast as possible for almost 5 hours until I eventually ran down through north Sydney and found my way to the harbor bridge. That was the first smile of the day. A kind fellow helped me up the stairs to the walkway and across I went. 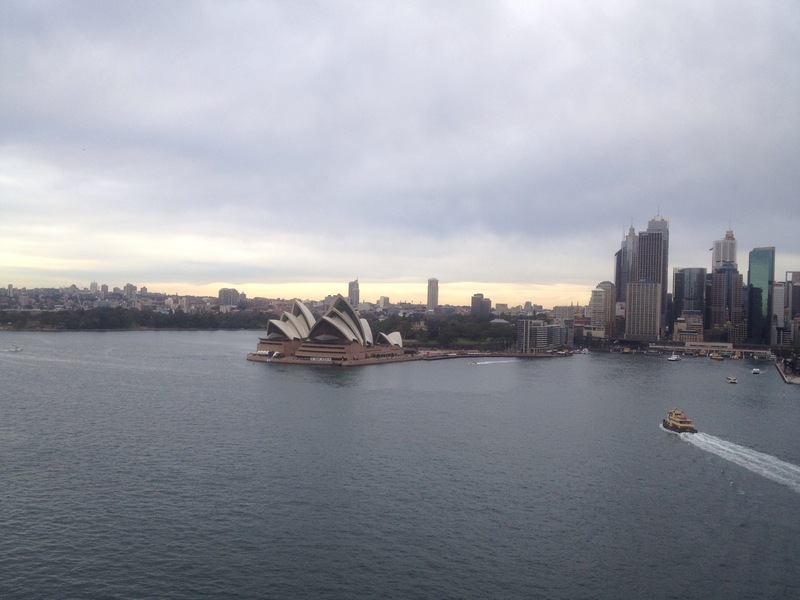 Suddenly, there is was – the iconic Sydney Opera House! That was it, a real symbol of what I had achieved, and I teared up to look at it. I was here, I had made it. I was so close to the finish! After a hectic run through central Sydney, always a little behind schedule, I reached the final road to Bondi. I met my dad on the corner and we ran the last 1km together. Down to the road, round the building and there it was – the beach and the finishing tape my friend Emma had strung across path. A final 20m and I was DONE!!! Mad, bad and dangerous to know… not really!!!! It was wonderful to meet my friends and family there, although i admit i was so tired and drained it was hard to appreciate. But it was also a moment I will always remember. It will take a few days to sink in I’m sure. I want to thank you ALL for following along, really it has kept me going through the hard times. I hope you have enjoyed reading this even half as much as I have enjoyed sharing this adventure with you. I will post a couple of ‘epilogue’ notes but for now let me just say a heartfelt THANK YOU! Penultimate day, and what a day. Furthest I’ve done on my whole trip, longest time of the whole trip, most difficult road in both up and down AND traffic. Today was my limit. BUT I did see sydney for the first time from the mountain side. Made me a bit emotional – now it is starting to feel real. Made me smile! 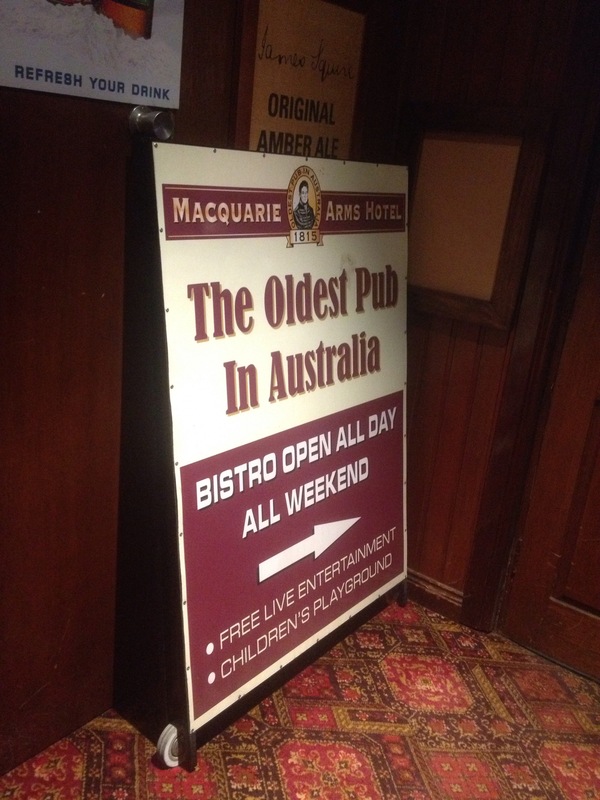 Plus finishing at the oldest pub in Australia in Windsor was a very nice touch (again a total accident!). An excellent end to the day! Final day today! Gotta dash so will write when I’m done! Day 80: One to remember! Day 80What a day! Up and down adventure, exactly what this trip is supposed to be about! It started badly when I work up to the rain hammering the tent. Having run out of food my breakfast was dry bread and rehydrated milk, plus a few squares of chocolate from my snack bag, so adding that to laying in a wet sleeping bag and then putting on cold wet clothes was not my idea of fun. Anyway, eventually I set off up the steep hill in the cloud. Exactly 0.7 miles / 1km later I reached the summit, turned a corner and found a 24hr cafe / petrol station and motel! Curse you Google Maps! Well, at least I could get coffee and a bacon sandwich, so I was happy once more. The running was tough all day; incessant steep hills up and down, sometimes with a shoulder and sometimes not, and the cloud I was in made it scary with the traffic. A few hours in and I saw blue flashing lights behind me; the cops pulled me over! Apparently there had been ‘complaints’. The guy was super chilled and we had a good chat, so I put my head torch on backwards and continued on. Result! Although if a driver has nothing better to do than complain about a guy running in a gutter in the rain while he doesn’t move his car/truck over a foot then I think I’m probably the winner between us when it comes to the ‘life’ game. I reached Lithgow – which was surprisingly scenic – as the rain stopped and had a meal in what seemed to be the world’s busiest McDonald’s. Who WERE all these people! Anyway I was soon out and on the road as the sun came out. There were roadworks and the smell of fresh earth and trees was fantastic – I was in the mountains now! Unfortunately the roadworks meant there wasn’t any shoulder for sections, and with the Friday night traffic the EPIC climb up to the plateau was horrific. In the end I stopped worrying; they were either going to hit me or not. Worst, most stressful moment of the trip. Never a good sign – ha get it?!! FINALY I got to the top and I was done. With the sun already set and it was 6km to the town with all the motels so I stopped at the main hotel in the town (Mt Victoria). Turns out it was the oldest tourist hotel in Australia, and it is fabulous! Super old and nothing works, but it is AUTHENTIC. It even has a roaring COAL fire in the bar. Haven’t seen one of those for a long long time. What a great end to the adventure of today, James is a happy man. 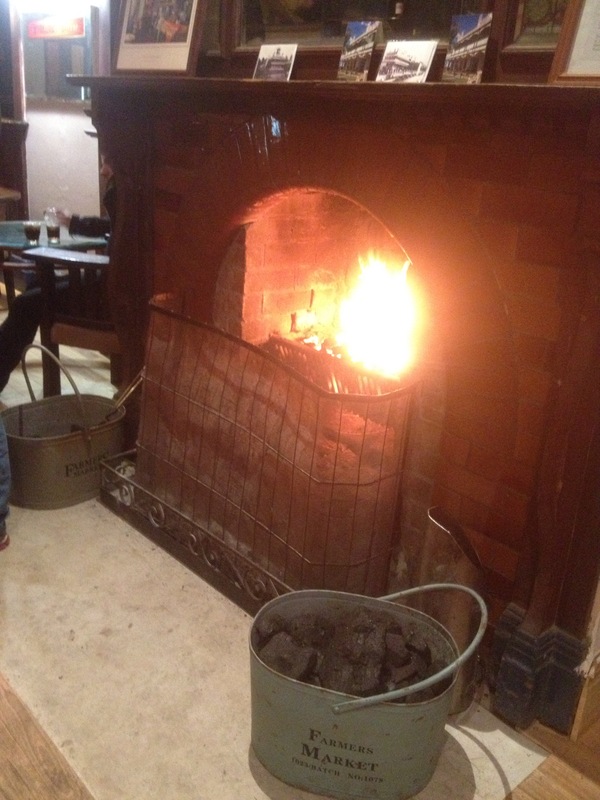 A roaring coal fire… just the ticket! I’m super tired so will keep it short(ish)! 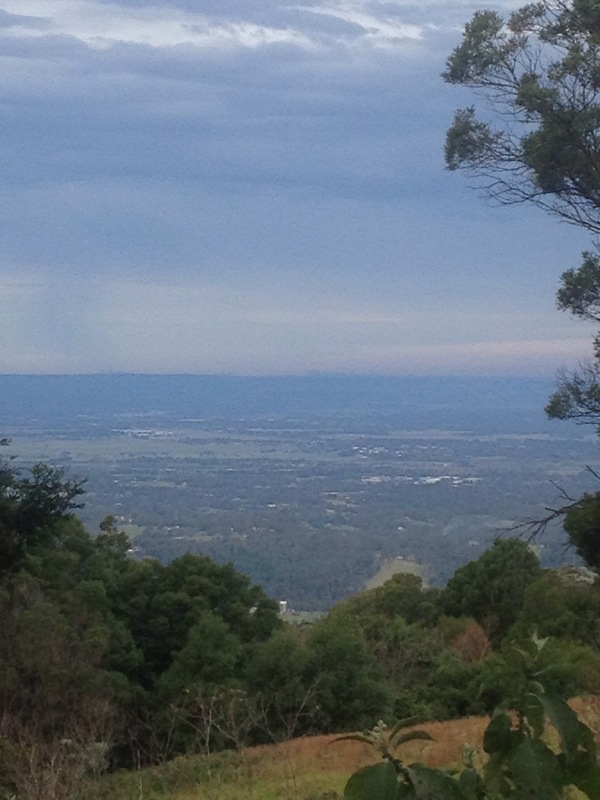 Making progress into the foothills of the blue mountains. Almost every stretch of road appears to be built going either vertically up or vertically down (Australian road builders appear to have forgotten the lost concept of ‘around’) which is making it very difficult going. Last night was the highlight of the last 2 days; I had misjudged the time needed to reach the next town so I ran for an hour in the dark. There was a wide shoulder and only a little traffic so it was actually nice. I think it was because it reminded me of winter climbing in the mountains, the icy air and the silence as you make your way through the darkness by head torch and moonlight. Smashing. I arrived in town and found a nice place to stay which was also the pub and had a fire – a wonderful reward! I also slept with an electric blanket for first time, another lovely surprise! Today has been very very hard. 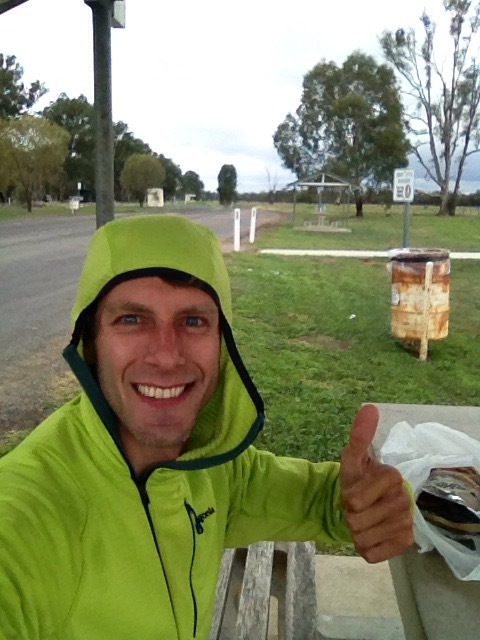 An unusually good nights sleep made the first 40km doable despite the hills, cold, fog and rain, and in the afternoon I arrived in Bathurst. Not super impressed, I must say, maybe I was just grumpy or maybe I’m just not used to bigger towns any more. Or both! 3 days to go (hopefully!). 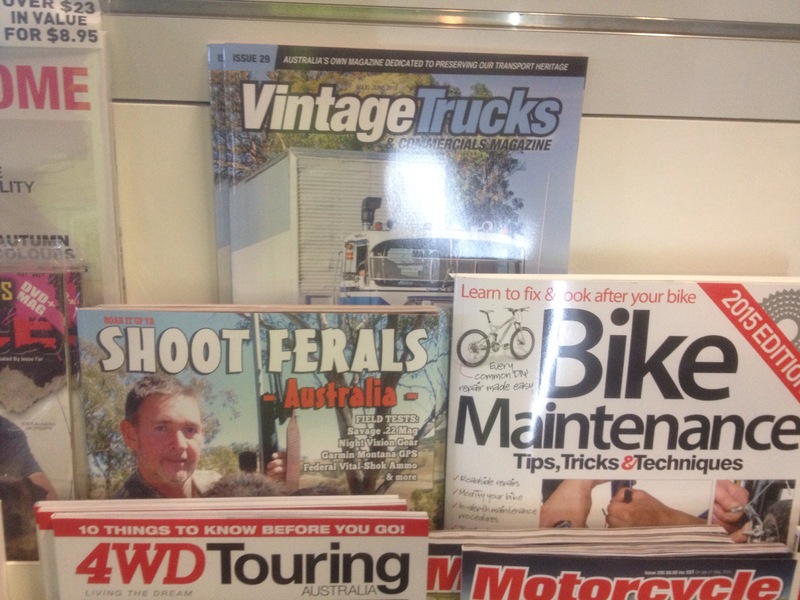 I will leave you with a photo of some good magazines I saw a few days ago. The run to Young yesterday was long but not too bad until the last 2 hours. Then I t appeared that despite being on a road with double reflectors on it the locals had temporarily removed most of the brain cells required for driving as soon as the sun went down. Like they had solar powered brains. Blind overtaking in the dark, driving WAY too close despite seeing me in quadruple spotlights, you name it. In short, a little bit nervy. I was relieved to reach town, only to find that pretty much every hotel and motel was shut or shut down. Not what you need when it is already approaching freezing and you are wet and it’s dark. I eventually found a good place and rewarded myself with a KFC, the first I’ve seen since Perth. I was thus reminded why I don’t have KFC very often…. This morning I was a broken man, just zero motivation to get going. 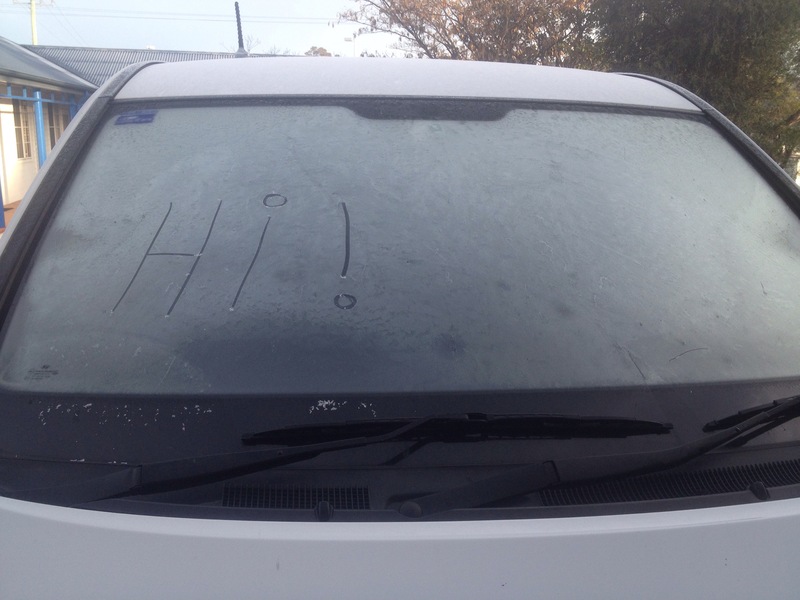 Eventually I did though, writing a message in the ice on the windscreen of the truck parked outside. Cold. The run was one of those which would have been lovely if it was short and I was in the right frame of mind, neither of which were true. The main good bit was meeting a lovely lady working in the only cafe in the only village on the way. She made a wicked burger with ‘the lot’ – it was a beast and much needed after I had very nearly thrown up at the roadside after a few too many biscuits eaten to ward off the cold. Day 75Tough tough tough day. Slept really badly and just didn’t have the energy after I woke up with it at 2C. 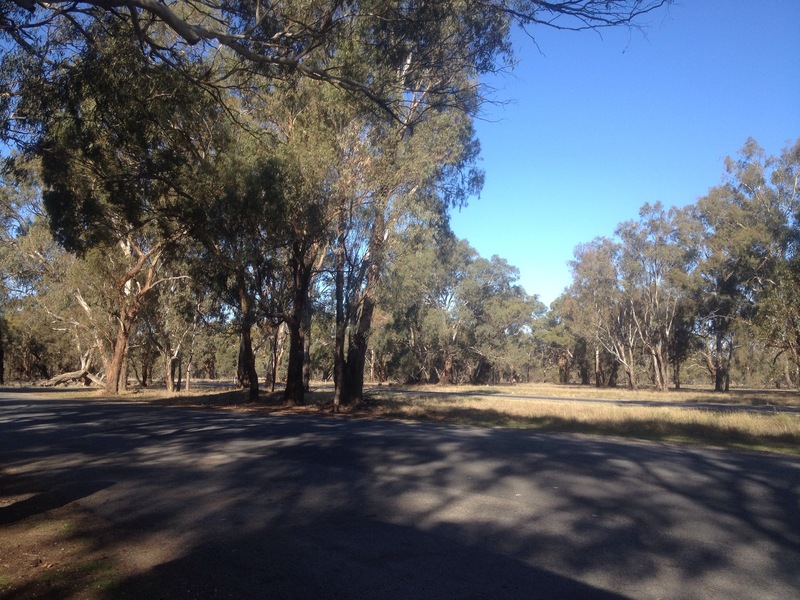 Every hilly mile was a fight but in the end I arrived in the dark at the little town of Bethungo and camped in the little rest area. 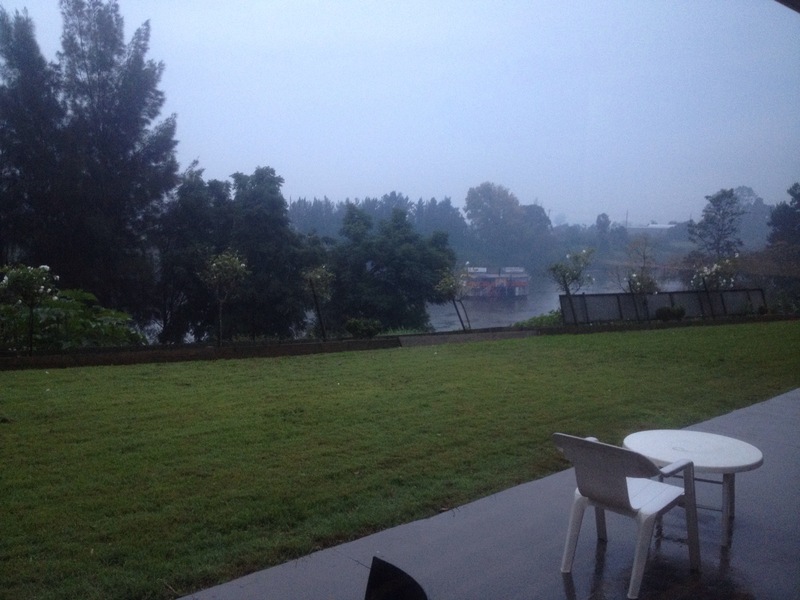 I woke up this morning to find it was about 50m before the hotel in town which hadn’t shown up on google. Grrr. 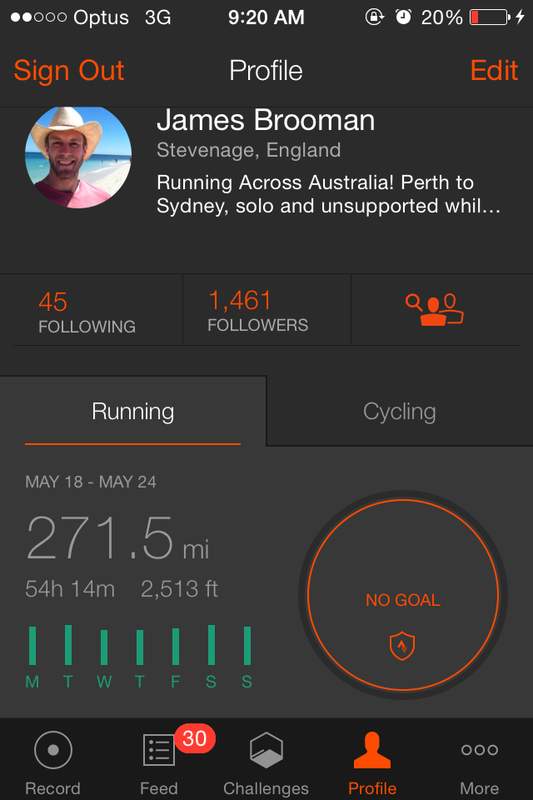 On the plus side, last week was a new max, 271 miles / 440km in 54 hours of running. 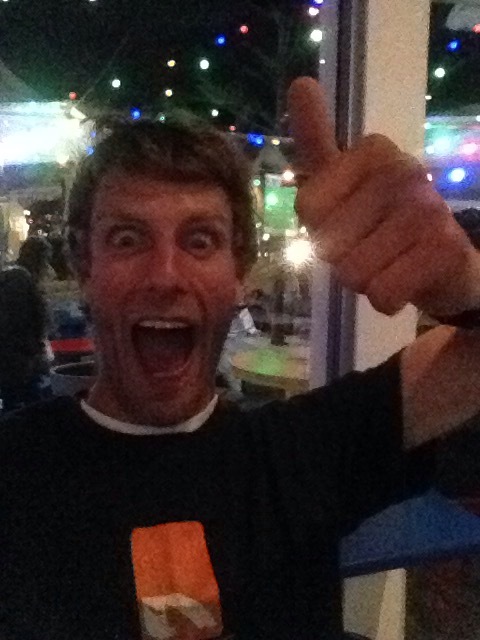 That’s a long way – to state the obviou – and I am definitely feeling it in my energy levels. But just one more week like that and I’m done! Days 73 and 74: Meat, anyone? It’s been a lovely 2 days for running and I have actually enjoyed them for the most part. I know that sounds strange, in that I either should enjoy most days or that I should enjoy running, but mostly I don’t. I’m mostly ambivalent; similar scenery, similar everything. But now for the last 2 days there have been pine trees and new birds and light winds, like a summer’s day run. And that has lifted my spirits. There have even been a few memorable moments, such as the ‘there is a fine for using leaded petrol’ sign at the caltex petrol station (it was banned here 13 years ago, by the way), but my favorite was being in the pub last night and watching the meat raffle. 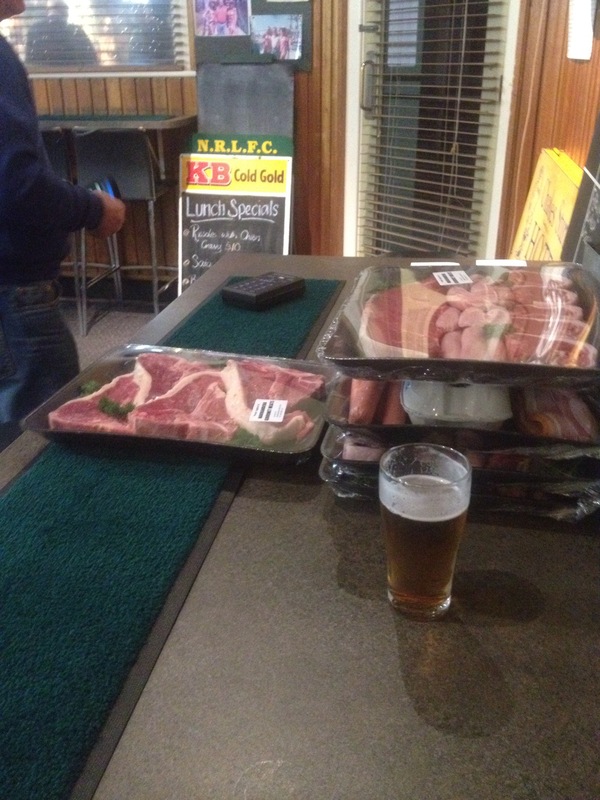 Yep, in the town’s main pub on a Friday night there was a raffle for some meat cuts. Awesome. This unrefridgerated meat could be yours!! So now I’m camped at the roadside once again listening to the wombats (I think) digging around my tent. 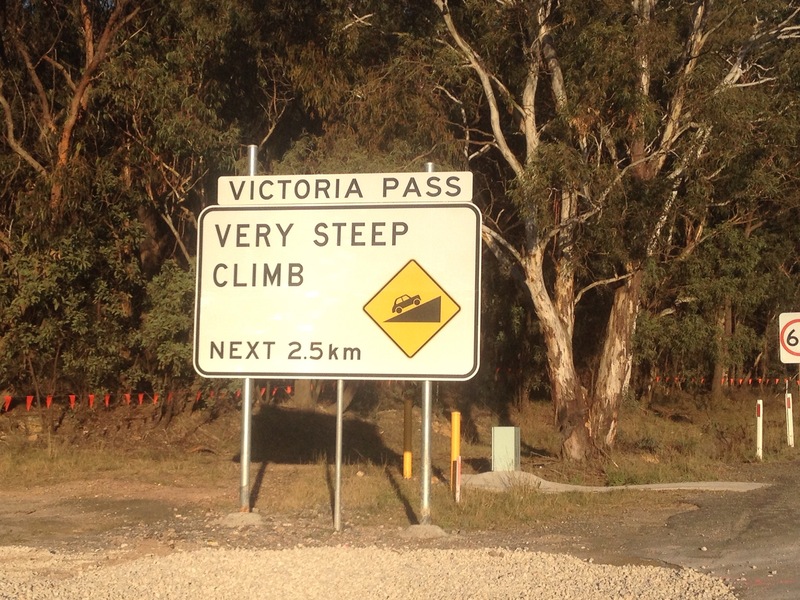 I hope they are wombats at least. It’s a hard push to make the end by next Sunday but I am trying; daylight is my biggest barrier, as in not enough of it. 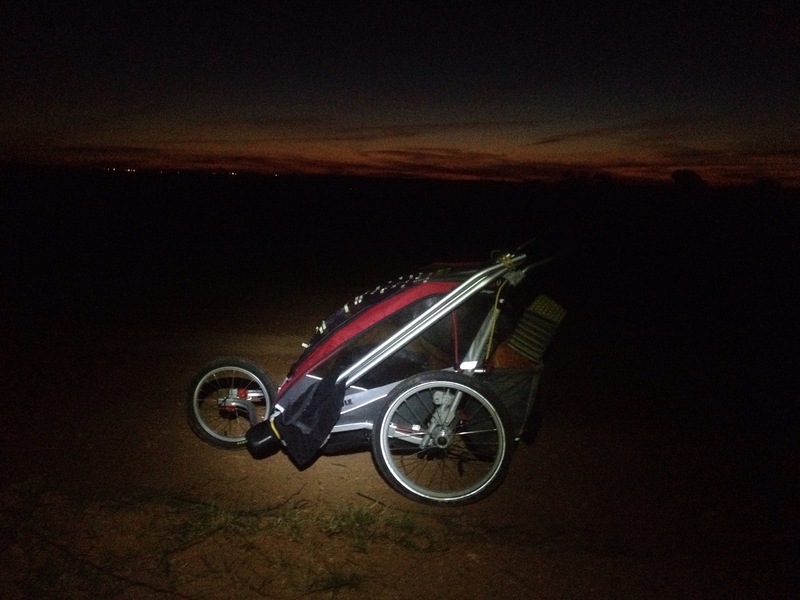 I start at dawn and finish at dusk before I am tired. Hopefully I can speed up and make it! Dragged myself out of my tent, shook the spiders off it and was on my way. Another day of reasonable conditions, cold but with only a light breeze and some brief drizzle spells. Combined with the smell of fresh wet earth from the fields I passed it pleasantly reminded me of England on a wet Aprils day. The only things which did anything to dispel that image were there parrots and the fact the fields were growing cotton. I’ve never seen that before. The roadside here for miles in every direction is strewn with what I thought was wool coming off these huge compacted bales which the trucks drive round, but it is cotton – You learn something every day. 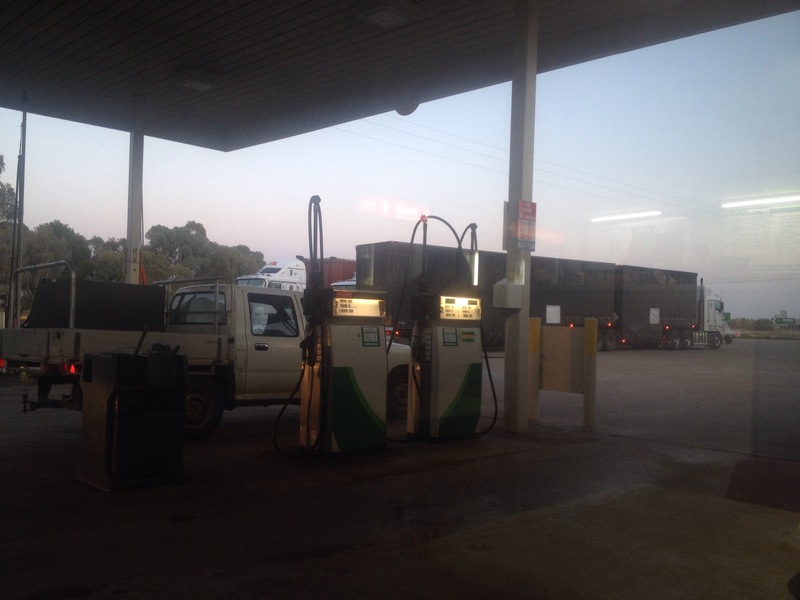 Arrived at dusk at the first piece of civilization for 120km / 75 miles, a BP petrol station. No motel though, so much to the bemusement of the woman behind the counter I asked if I could put up a tent outside. “Don’t get run over by the trucks, though.” was her advice. Um, OK. So with the money saved I will donate that to Nepal earthquake relief. Nice to be able to do something good, even from the middle of nowhere. Now that is a room with a view! Only 400 miles to go now! jamesrbrooman on The next adventure! Pat Colbert on The next adventure! David Stockman on The next adventure!